This memorandum presents improvements for the Danvers Rail Trail crossing at Poplar Street (Route 62) in Danvers. The first section of this memorandum presents an overview of the Danvers Rail Trail crossing at Poplar Street and existing problems. The second section provides analyses of existing conditions, describes proposed improvements, and provides estimates of construction costs. The memorandum also includes technical appendices that contain detailed figures that show results of traffic and pedestrian counts and proposed options developed for consideration. The Danvers Rail Trail is a 4.3-mile pedestrian and bicycle path that runs in a north-south direction through the heart of Danvers. It was previously an abandoned railroad right-of-way until the Town of Danvers signed a 99-year lease agreement with the MBTA in November 2008 in order to convert it into a path for bicycle, pedestrian, and other nonmotorized public transportation and recreation purposes. The path is used all year round, although no snow removal is planned for the winter months. Activities during winter months include cross-country skiing, snowshoeing, bird-watching, cycling, walking, and running. Use by motorized vehicles is expressly forbidden in the MBTA lease and Town policy. 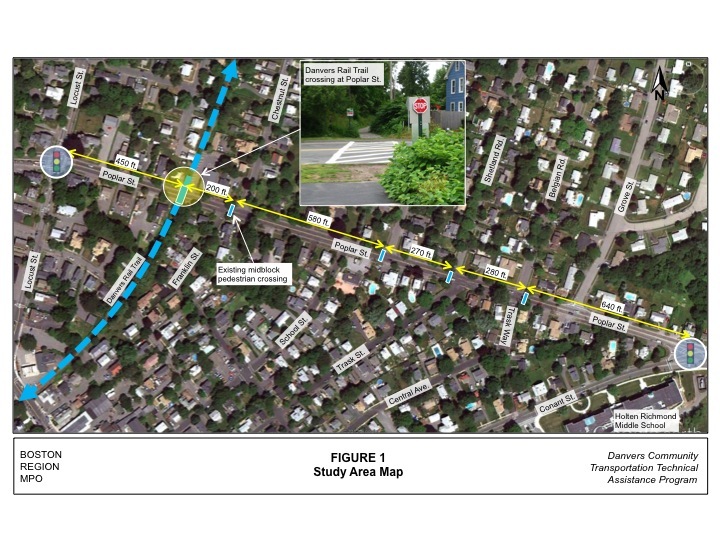 Figure 1 shows the study area, land use, and the Danvers Rail Trail crossing at Poplar Street. The trail crossing at Poplar Street is located about 450 feet east of the intersection of Locust Street and Poplar Street, a very busy signalized intersection. Poplar Street and Locust Street, in the vicinity of the Danvers Rail Trail crossing, are owned and maintained by the Town of Danvers. The land use in the vicinity of the rail-trail crossing is primarily residential, and the Holten Richmond Middle School is located about 0.4 miles east of the trail crossing. MPO staff met with Danvers town Planners to discuss the pedestrian and bicycle safety concerns at the Poplar Street crossing. The primary concern is the high volume of traffic on Poplar Street, which increases the risk to the high number of trail users. In addition, there are no curb cuts and ramps from the trail to the roadway. The absence of curb cuts, ramps, and paving at the approach of the trail is not only inconvenient for trail users, but it is also becoming a hazard. Another safety issue is sight lines and distances; trees, signs, and utility poles impact sight lines and distances due to the location of trail stop signs, which are set back about 25 to 30 feet from the center of each vehicle travel lane. Although the existing trail crossing at Poplar Street is marked and signed as a midblock crossing, the signage is considered inadequate because of the high volumes of vehicles and trail users at that location. The Town of Danvers is seeking to improve safety at the Poplar Street crossing for motorists, pedestrians, and bicyclists. The trail officially opened in June 2012, and the number of trail users is expected to increase in the near future. Poplar Street is part of Route 62, a major roadway connecting Middleton to the west and Beverly to the east. In addition, it is a major roadway providing access to Route 128, Interstate 95, and Route 1. It is classified as an urban principal arterial, and carries about 20,000 vehicles per weekday according to MassDOT roadway inventory file. The percent of heavy vehicles in the mix is in the range of 1 to 2 percent. During each peak hour (AM or PM), between 1,700 and 2,000 vehicles (both directions combined) cross the trail at Poplar Street (Figure 2). Although the existing trail crossing at Poplar Street is marked and signed as an unsignalized midblock crossing, it is still considered inadequate because of the high volumes of vehicles and trail users at that location. As noted in the MassDOT Project Development and Design Guide, traffic signals shall be considered, where a trail crosses a roadway with volumes greater than 10,000 vehicles per day. 3 According to a study conducted by the US Department of Transportation’s Federal Highway Administration (FHWA), marked crosswalks alone are insufficient when a trail crosses a two-lane roadway with average daily traffic (ADT) greater than 15,000 vehicles and a speed limit of 35 mph or higher, because pedestrians’ and bicyclists’ risk may increase by providing only a marked crosswalk.4 Consideration should be given to other treatments, such as flashing beacons, traffic calming, and pedestrian signals. 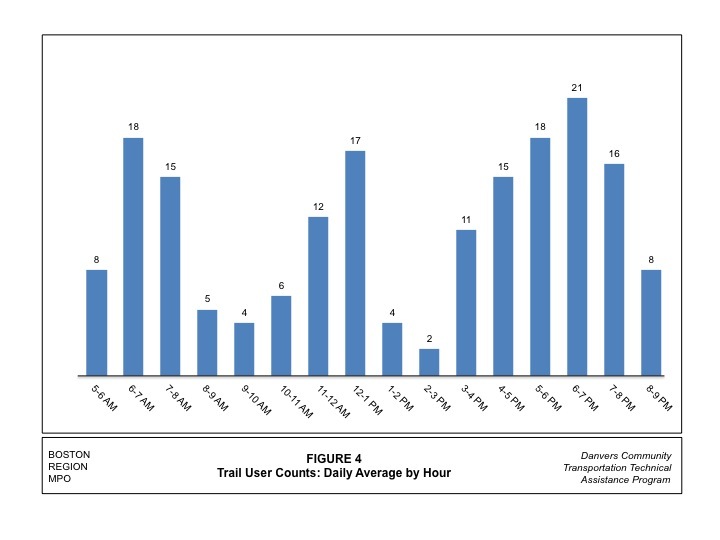 Trail user volume counts conducted in July 2011 by the Town of Danvers are shown in Figures 3 and 4. The counts were conducted by using video cameras along the trail. 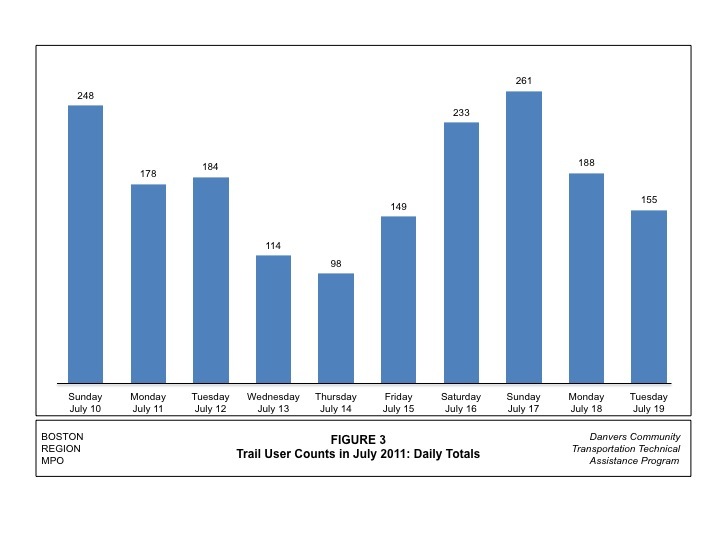 During the time when the trail-user volume counts were conducted, the trail was not officially open; hence the number of users was expected to increase after its official opening, last month (June 2012). The results of the counts indicate that the highest number of trail users occurs on weekends—between 233 and 261 people. The counts also show that there is significant usage during the workdays; during each of the AM, midday, and PM peak hours, an average of about 20 people use the Poplar Street trail crossing. The Town of Danvers submitted recent trail counts conducted between August 4 and August 11 at the Poplar Street crossing looking south of the trail (Table 1). During the counting, it was observed that some trail users turn back at the Poplar Street intersection and do not cross it. In addition, it was observed that of over 600 bike riders, only one walked their bike. Note: Of over 600 bike riders, only one walked their bike. 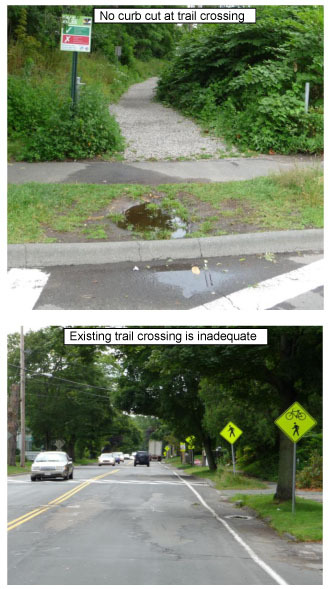 Sight distance is an important factor in the design of trail crossings. It is the length of roadway that is visible to a motorist, and in this case, also to a trail user. Installing crosswalks at locations with poor sight distance could present increased risk to pedestrians and bicyclists. Sight distance is affected by road geometry, such as grades and curves; by roadside vegetation, such as landscaping trees; by utility poles; and by other roadway elements, such as signs. Sight lines must be kept free of obstructions that might interfere with the ability of a motorist or trail user to verify that the roadway is clear. Presently, the stop signs posted at the approach of the trail are set back about 25 to 30 feet from the center of each vehicle travel lane due to the design elements of Poplar Street, which include 2-to-3-foot-wide shoulders and wide buffers with trees between the sidewalks and the roadway curbs. The trees and utility poles along Poplar Street affect sight distance; hence enhanced treatments to the existing marked crosswalks are essential for increasing safety for trail users. The Danvers Rail Trail is located about 450 feet east of the Poplar Street and Locust Street signalized intersection. MPO staff collected turning-movement counts and signal information at that intersection to determine any impacts it may have on the trail crossing. The turning movement counts were collected for the peak periods, 7:00–9:00 AM and 4:00–6:00 PM, and are summarized and presented in Figure 2. Intersection capacity analyses conducted by MPO staff indicated that during peak periods there is the likelihood that the 95th percentile queue of the westbound traffic would extend into the trail crossing (Table 2). 1Delay in seconds per vehicle. 2 95th percentile queue in feet. # = 95th percentile volume exceeds capacity. There are four other crosswalks in the vicinity of the Poplar Street trail crossing; the closest crosswalk is about 200 feet east of the trail crossing. Students walking to the nearby Holten Richmond Middle School and school buses picking up and dropping off students along Poplar Street may justify these midblock pedestrian crossings; however, MPO staff did not conduct a study to determine if all of the midblock pedestrian crossings are warranted because it was beyond the scope of this study. 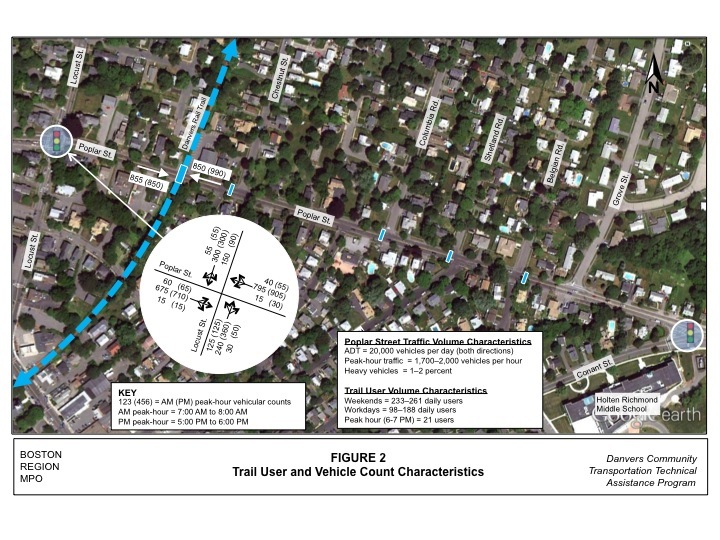 The Danvers Rail Trail has been in use for only about a year (prior to its official opening last month); therefore, there is no reliable pedestrian-vehicle or bicyclist-vehicle crash data for the Poplar Street trail crossing for analysis. However, implementing trail-roadway crossing safety improvements should be proactive and is especially important where there is a high number of pedestrians and bicyclists, exposure to high volumes of vehicles, and high vehicle speeds (posted or observed). Flashing beacons are warning signs typically placed in advance of a marked crosswalk or on signs located adjacent to the crosswalk entry. Flashing amber beacons can be installed on traffic signal poles and mast arms or post-mounted on the roadside along with signs. 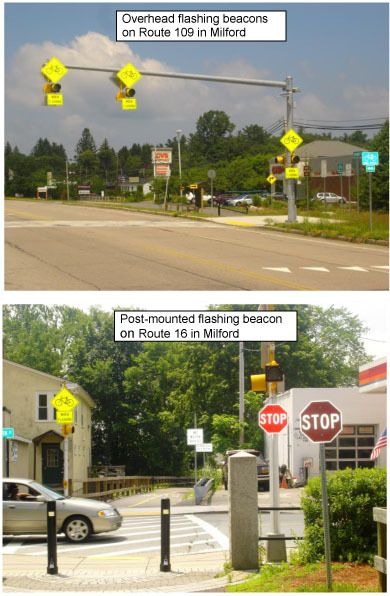 Different types of flashing beacons have been installed on major roadways in Milford to assist pedestrians and bicyclists in crossing at marked crosswalks that serve Upper Charles Trail crossings at Route109 (Medway Street) and Route 16 (East Main Street). Flashing beacons can be programmed to either operate continuously or be pedestrian activated. Pedestrian-activated flashing beacons remain “dark” until activated. Compliance for flashing beacons is generally higher when some form of pedestrian activation is used in conjunction with the flashing beacon installation. 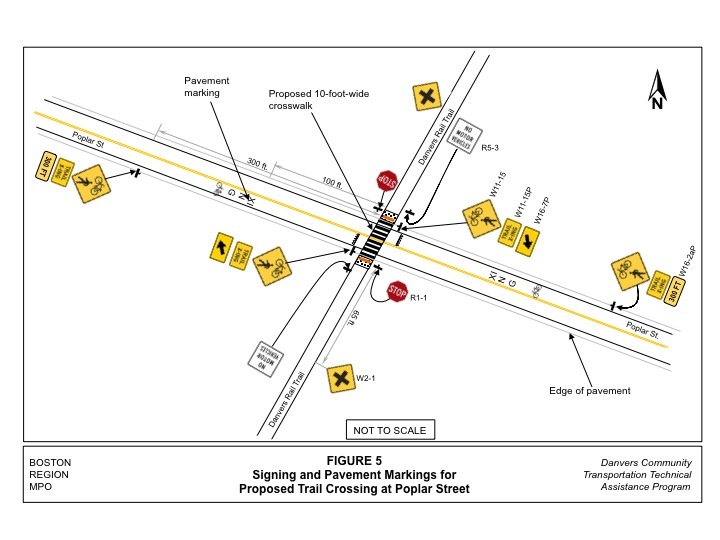 Figure 5 shows the proposed signing and pavement markings for the Poplar Street trail crossing. 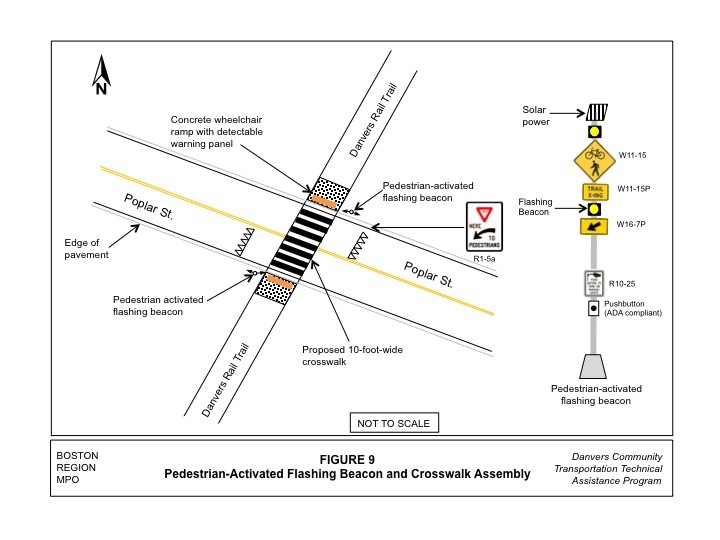 Figure 6 shows the pedestrian-activated flashing beacon proposed for the Danvers trail crossing at Poplar Street. The assembly consists of the installation of the four-beacon system at the Poplar Street trail crossing. For each approach to the trail’s crosswalk, a pedestrian-activated flashing beacon is installed on the left and right sides of the roadway at the crosswalk. 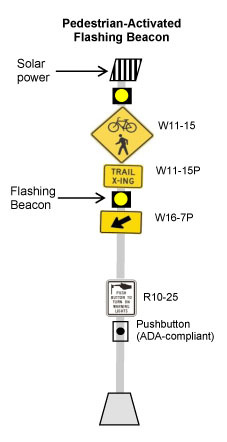 The flashing beacon is mounted directly below the standard crosswalk or trail crosswalk warning signs, including W11-15 (shared-use trail crossing) and W11-15P (trail crossing) signs, and above the diagonal downward arrow (W16-7p) plaque. Another flashing beacon is mounted above the shared-use trail crossing sign. Flashing beacons increase drivers’ awareness when they are approaching a marked crosswalk at an uncontrolled location. In addition, they have the flexibility of being pedestrian-activated or programmed to operate continuously. In addition flashing beacons can run on solar or electric power. Not as effective as RRFBs or PHB. Data show RRFBs and PHBs have very high rate motorist compliance (80 to 100 percent), in comparison to far lower rates (15 to 20 percent) for standard flashing beacons. Post-mounted flashing beacons for the Poplar Street trail crossing are estimated to cost approximately $25,000 to $30,000 for purchase and installation of a four-beacon system (one on either side of the roadway for each approach). The cost estimate includes solar panels for powering the units, signage on both approaches to the crosswalk, all posts (poles); either passive infrared detection or push buttons with audio instructions; and crosswalk improvements such as curb cuts, concrete wheelchair ramps leading from the trail to the roadway, and detectable warning panels at the ends of the ramps for ADA compliance. 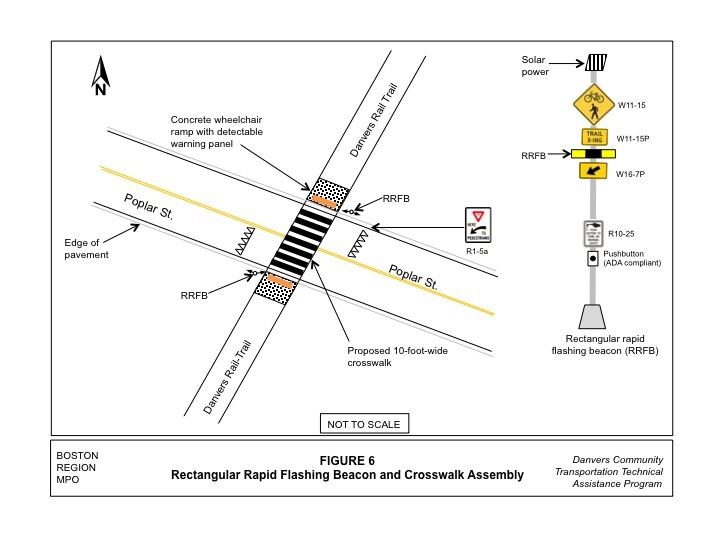 Solar-powered rectangular rapid flashing beacons (RRFB) are a new type of warning device developed to improve safety at uncontrolled marked crosswalks. They are pedestrian-activated warning systems that alert motorists about pedestrians and bicyclists wanting to enter the crosswalk. The high-intensity rapid flashing yellow lights achieve yielding rates that previously have only been achieved with devices that have a red indication. In addition, RRFBs are extremely cost-effective to install, particularly when solar and wireless technology is used, since grid connections and trenching across the roadway are not required. RRFBs are pedestrian-activated amber LEDs that supplement warning signs at midblock crosswalks. They can be activated by pedestrians manually by a push button or passively by an automated pedestrian detection system (video or infrared). RRFBs remain dark (not active) until they are activated. RRFBs use a wig-wag flash patterning similar to emergency flashers on police vehicles, and may be installed on either two-lane or multi-lane roadways. RRFBs typically receive power by stand-alone solar panel units, but may also be wired to a traditional power source. In 2010, the FHWA completed a two-year study of rectangular rapid flashing beacon installations at 22 locations.5 Motorists’ yielding rates before the RRFBs were installed were between 0 and 26 percent; two years after their installation, yielding rates improved to 81 percent with the two-beacon system. Yielding compliance increased from 81 to 88 percent following the installation of the four-beacon system at the sites, which was statistically significant. The majority of locations were four lane roadways, with and without median refuge islands. Most locations had daily vehicle volumes of 12,000 or more and posted speed limits of 35 mph. 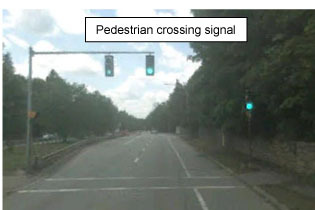 RRFBs are a lower-cost alternative to pedestrian crossing signals and hybrid signals (described below) that are shown to increase driver yielding behavior at crosswalks significantly when supplementing standard pedestrian-crossing warning signs and markings. The unique rectangular rapid wig-wag flashing yields a greater response from drivers than traditional methods and results in a lower rate of rear-end vehicle crashes. An RRFB improves pedestrian visibility and safety and increases the safety effectiveness of other treatments, such as the use of advance yield markings and signs. An RRFB allows for normal traffic flow when not actuated, and is capable of running on solar or electric power. The primary disadvantage of an RRFB is pedestrians misinterpreting the flashing light and not waiting for traffic to stop before entering the crosswalk. The cost is approximately $25,000–$30,000 for the purchase and installation of a four-beacon system (one on either side of the roadway for each approach). This includes solar panels for powering the units, signage on both approaches to the crosswalk, poles, passive infrared detection or push buttons with audio instructions, and crosswalk improvements such as curb cuts, concrete wheelchair ramps leading from the trail to the roadway, and detectable warning panels at the ends of the ramps for ADA compliance. A pedestrian hybrid beacon, also known as the High-Intensity Activated crossWalK (HAWK) beacon, is a special type of hybrid beacon used to warn and control traffic at an unsignalized marked crosswalk to assist pedestrians in crossing a street or highway. It is usually considered for installation to facilitate pedestrian crossings at a location that does not meet traffic signal warrants, or at a location that meets traffic signal warrants but when a decision is made not to install a pedestrian crossing signal. Independent studies conducted by the Texas Transportation Institute found a PHB to be nearly as effective as a pedestrian crossing signal, with 97 percent motorist compliance. A PHB uses six sequences of indications to warn and control traffic at an unsignalized marked crosswalk to help pedestrians and bicyclists cross a street. The beacon head remains "dark" until activated by a pedestrian (Sequence 1). The pedestrian pushes an easy-to-reach push button that activates the beacon. Upon activation, the beacon display briefly flashes yellow (Sequence 2) followed by a steady yellow warning (Sequence 3). The beacon then displays a steady red indication on the upper two red lenses to drivers to stop traffic and a "walk" indication to pedestrians at the same time, allowing pedestrians to cross a major roadway while traffic is stopped (Sequence 4). 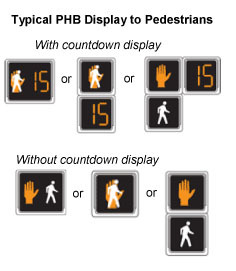 After the pedestrian "walk” phase ends, the pedestrian indication changes to a flashing orange hand with or without a countdown display to notify pedestrians that their clearance time is about to end; at the same time, the PHB displays alternating flashing red lights to drivers while pedestrians finish crossing (Sequence 5). After the pedestrian clearance time ends, the PHB turns dark again at the conclusion of the cycle until activated (Sequence 6). The Danvers Rail Trail crossing at Poplar Street meets the guidelines specified in the MUTCD for the installation of PHBs on low-speed roadways. At the trail crossing, Poplar Street has a posted speed limit of 35 mph, 1,700–2,000 vehicles per hour during the AM and PM peak hours, a crosswalk length of 35 feet, and 20 pedestrians per hour during peak hours. 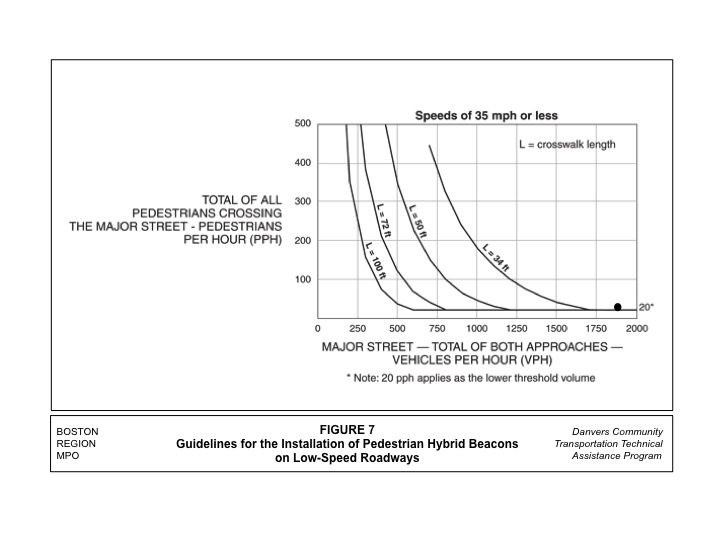 The MUTCD guidance states that for a major street where the posted speed limit or the 85th-percentile speed is 35 mph or less, the need for a pedestrian hybrid beacon should be considered if the engineering study finds that the plotted point representing the vehicles per hour on the major street (the total of both approaches) and the corresponding total of all pedestrians crossing the major street for one hour (any four consecutive 15-minute periods) of an average day falls above the applicable curve in Figure 8 for the length of the crosswalk. A PHB is a great intermediate option between the operational requirements (cost and benefits) of an RRFB and a full pedestrian signal because it provides a positive stop control in areas without the high pedestrian traffic volumes that typically warrant the installation of a signal. In addition, red "stop" beacons and countdown signal heads send a message to both driver and pedestrian when it is safe to proceed. In addition, the alternating red signal heads allow vehicles to proceed once the pedestrian has cleared their side of the travel lane, thus improving vehicle traffic flow. PHBs have motorists yielding rates close to 100 percent. The main drawback of a PHB is that it is a traffic control device many people are not yet familiar with; therefore, efforts should be made to perform outreach to the public before implementation so there is no confusion about how the beacon operates and what drivers and pedestrians should do when encountering it. Installing PHBs at the Poplar Street trail crossing is estimated to cost between $50,000 and $70,000. This includes two poles for Polar Street, two PHB indications in each direction, pedestrian countdown indications that are /ADA-compliant, signs on Poplar Street, trail, an interconnection with nearby signals, and wig-wag red flashing. The cost also includes curb cuts, concrete wheelchair ramps leading from the trail to Poplar Street, and detectable warning panels at the ends of the ramps for ADA compliance. An assessment of the Danvers Rail Trail crossing at Poplar Street was conducted to determine if it qualifies for the installation of a pedestrian crossing signal. A pedestrian crossing signal is used to control traffic at midblock crosswalks with high pedestrian volumes and/or insufficient gaps in vehicle traffic for pedestrians to cross. Pedestrian crossing signals are subject to requirements specified in the MUTCD; it must satisfy the pedestrian volume signal warrant (Warrant 4) before it is installed.6 However, satisfaction of the pedestrian volume warrant shall not in itself require the installation of a pedestrian signal; the final decision is made based upon engineering judgment that considers vehicle traffic volume, pedestrian activity, midblock crossing crash history, and the physical environment in order to determine whether or not a crossing warrants a traffic control signal. Pedestrian push-button activation (ADA-compliant) and R10-25 signs at the roadside to activate the warning device. Pedestrian crossing signals remain “resting” in green until a pedestrian activates a push button on either side of the crossing. Once activated, pedestrian crossing signals use standard traffic signal indications to give pedestrians an opportunity to cross a roadway. The pedestrian phase consists of walk/don’t walk indications and a steady red indication or a sequence of steady red and then flashing red indications for drivers. Supplemental signs are typically used to indicate that the signal is for pedestrians. The pedestrian volume using the Poplar Street trail crossing during an average day is 107 or more for each of any four hours. The pedestrian volume using the Poplar Street trail crossing during an average day is 133 or more during the peak hour. The criterion for the pedestrian volume warrant may be reduced by as much as 50 percent if the 15th-percentile crossing speeds of pedestrians are less than 3.5 feet per second. Assuming a worst-case scenario where the 15th-percentile crossing speeds of pedestrians using the Poplar Street trail crossing are less than 3.5 feet per second, 67 or more pedestrians per hour during the peak hour or 54 or more for each of any four hours is needed to satisfy Warrant 4. The trail user counts indicate that approximately 20 pedestrians use the Poplar Street trail crossing during peak hour on an average day; the pedestrian volume signal warrant is not met. Because the Danvers Rail Trail officially opened in June (of 2012), we expect the number of trail users to increase in the near future. MPO staff do not have forecasts of the levels and types of future trail use, which would have been useful for this analysis. For these reasons MPO staff recommend a pedestrian crossing signal option for consideration and discussion. Pedestrian crossing signals increase driver awareness and provide pedestrians an opportunity to cross at a controlled crosswalk during a pedestrian walk interval. They are “intuitive” because they use standard signal configuration to communicate to drivers and pedestrians. In addition, they are pedestrian activated and have high driver yielding rates. The primary disadvantages of pedestrian signals are that they have high installation and maintenance costs. In addition, the stop condition disrupts traffic flow and could increase the risk of rear-end collisions. Having the traffic signal remain green for long periods of time may increase driver noncompliance, and the installation of a signal must meet MUTCD signal warrants for heavy pedestrian use, which are rarely met due to the high thresholds required. Installing a pedestrian crossing signal at the trail crossing at Poplar Street is estimated to cost between $80,000 and $100,000. This includes two poles for Polar Street, vehicle and pedestrian signal heads in each direction, pedestrian countdown indications that are ADA-compliant, signs on Poplar Street and on the trail, and an interconnection with nearby signals. The cost also includes curb cuts, concrete wheelchair ramps leading from the trail to Poplar Street, and detectable warning panels at the ends of the ramps for ADA compliance. The above analyses and evaluation indicate that the Danvers Rail Trail crossing at Poplar Street needs some enhancements to improve safety for trail users. Poplar Street carries about 20,000 vehicles per day and has posted speed limit of 35 mph. The Danvers Rail-Trail was officially opened in June 2012 and the number of trail users is expected to increase in the future, so a proactive approach to increase safety at the Poplar Street crossing is needed. 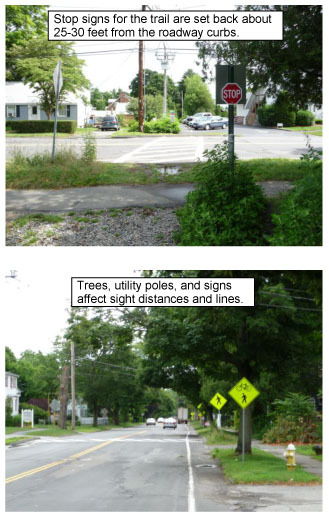 MassDOT’s Project Development and Design Guide notes that traffic signals shall be considered where a trail crosses a roadway with volumes greater than 10,000 vehicles per day. Recent advances in pedestrian crossing safety improvements and technologies have introduced new cost-effective devices including RRFB, PHB, and pedestrian-activated flashing beacons. 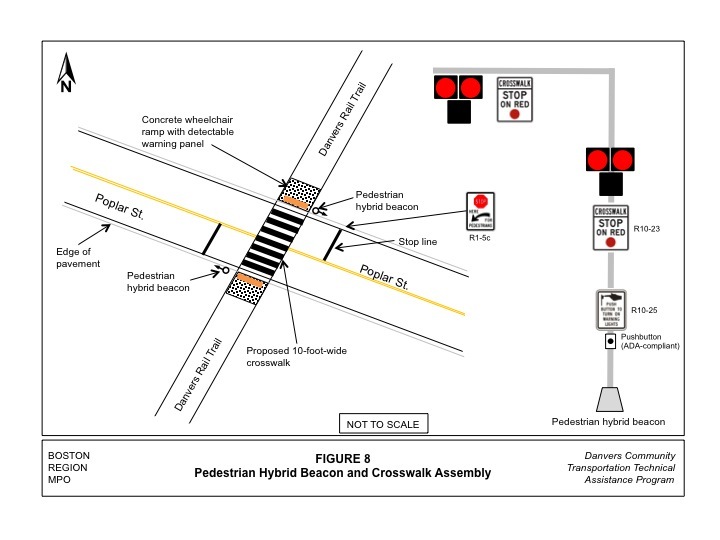 Such new devices increase driver yield rates at crosswalk locations that do not meet warrants for installation of a pedestrian crossing signal or at locations where signage and pavement marking alone are ineffective. MPO staff have developed four crossing options to improve safety for trail users at the Poplar Street crossing. Cost and effectiveness are the two primary factors for selecting the preferred option. Option 1: Flashing beacons post-mounted on the roadside with warning signs placed in advance of the marked crosswalk improve safety for pedestrians in crosswalks by increasing driver awareness. It is estimated to cost approximately $25,000 to $30,000 to install a four-beacon system (one on either side of the roadway for each approach). Compliance for flashing beacons is generally higher when some form of pedestrian activation and/or wig-wag flashing pattern is used in conjunction with the flashing beacon installation. The main disadvantages of flashing amber beacons are that they do not provide a steady red signal indication requiring traffic to stop, and they also have some maintenance costs. Option 2: RRFBs are a lower-cost alternative to pedestrian crossing signals and pedestrian hybrid signals that are shown to significantly increase driver yielding behavior at crosswalks when supplementing standard pedestrian crossing warning signs and markings. They are estimated to cost about $25,000 to $30,000 for installation at the Poplar Street trail crossing. RRFBs can be activated manually by pedestrians using push buttons or passively by an automated pedestrian detection system (video or infrared). RRFBs have the flexibility to operate on solar power or to be wired to a traditional electric power source. In addition, the wig-wag flashing patterning similar to emergency flashers on police vehicles is very effective and it can be used on either two-lane or multi-lane roadways. An RRFB allows for normal traffic flow when not activated. Option 3: PHBs are cost-effective when compared to pedestrian crossing signals, especially for locations that do not meet typical pedestrian volume signal warrants for installing a pedestrian crossing signal. Its installation is estimated to cost between $50,000 and $70,000. PHBs improve visibility for crossing pedestrians and motorists. Their red indications have high driver compliance rates. PHBs give drivers an indication that conditions are changing with flashing yellow and steady yellow indications, and provide a clearance interval for pedestrians. They can be pedestrian-activated using push buttons, or automated using a pedestrian detection system (video or infrared). The main drawbacks of PHBs are high installation and maintenance costs compared to RRFBs or flashing beacons. In addition, they are known to confuse drivers who do not understand the meaning of the sequence of indications of a PHB. Option 4: Pedestrian crossing signals increase driver awareness and allow crossing at controlled crosswalks. Installing a pedestrian crossing signal at the trail crossing at Poplar Street is estimated to cost between $80,000 and $100,000. These signals are intuitive because they use a standard signal configuration and indications to communicate to drivers and pedestrians. In addition, they are pedestrian activated and have high driver yielding rates. The primary difficulties with pedestrian crossing signals are that they have high installation and maintenance costs. In addition, the stop condition disrupts traffic flow and could increase the risk of rear-end collisions. In addition, these signals may increase driver noncompliance if they remain in the green phase for long periods. Options 1 and 2 are effective, low-cost crossing improvements for the Danvers Rail Trail crossing at Poplar Street. Options 3 and 4 are also effective, but would be more expensive to install. Option 3 is not commonly used in Massachusetts; therefore, efforts would need to be made to perform outreach to the public before implementation so that there would be no confusion about how the beacon operates and what drivers and pedestrians should do when encountering it. 1 PEDSAFE: Pedestrian Safety Guide and Countermeasure Selection System, U.S. Department of Transportation, Federal Highway Administration, Report Number FHWA-SA-04-003, September 2004. 2 Massachusetts Department of Transportation, Highway Division, Project Development and Design Guide, Chapter 11, Section 11.4.9.1, January 2006. 4U.S. Department of Transportation Federal Highway Administration Study, “Safety Effects of Marked versus Unmarked Crosswalks at Uncontrolled Locations,” Final Report and Recommendations, FHWA Publication Number HRT-04-100, September 2005. 5 Jim Shurbutt and Ron Van Houten, Effects of Yellow Rectangular Rapid-Flashing Beacons on Yielding at Multilane Uncontrolled Crosswalks, Report No. FHWA-HRT-10-043, USDOT, FHWA, McClean, VA, September 2010.